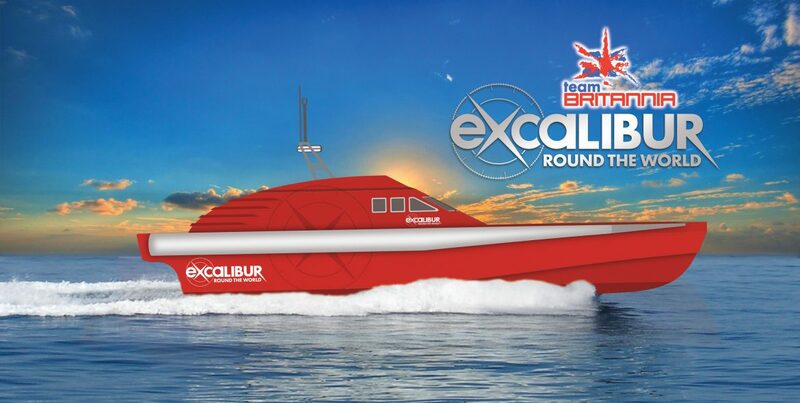 Team Britannia will use a innovative fixing and insert to secure its’ massive inflatable tubes to the outside of its boat on its round the world record attempt. The fixings and inserts from industry leaders Technifast have been specifically developed to allow the fitting of the two white tubes, which each weigh around 250kg, to the side of boat, without large numbers of people working on either side of the hull. This is important as should either tube be damaged during the 23,000 nautical mile record attempt, the crew need to be able to replace the tubes without putting the vessel into a dry-dock. The announcement will be made at the Aluminium Boatbuilding Company on Hayling Island, where the 80ft RIB is being built, by ocean racing legend and Team Britannia’s skipper Alan Priddy and Technifast’s Senior Engineer, John Garner. Alan explained: “We encountered an issue attaching our two huge inflatable tubes to the port and starboard sides of the boat. The hull of the boat is constructed from 6mm aluminium plate, and the fixing plates for the tubes required M10 bolts to be used. “Tapping directly into the aluminium hull with M10 bolts would not be strong enough, as the softness of the aluminium material coupled with the constant slamming of the boat, would pose a risk of the bolts stripping the threaded aluminium and pulling out. After conversations between Alan and Technifast’s Senior Engineer, John Garner, a design was finalised for an insert, which would increase the holding strength in the aluminium, but still allow the M10 fixings to be used to hold the two tubes in place. Crucially, it will give the option to release the tubes quickly in an emergency and for easy replacement. John Garner explained: “As soon as it became clear what Team Britannia were attempting to do we were delighted to offer our services and support as a partner to this record attempt. “The new design, uses a larger metric external thread to give more surface area and better grip. We also removed all undercuts and extended the exterior thread length to ensure that every available millimetre of the insert will provide hold to the relatively thin and light hull of the boat. Work to complete the fitting out of the boat is well underway, with a revised completion date in late spring. It means that the record attempt could be launched as early as the winter, following lengthy sea trials and testing. This latest announcement follows the news that global logistics and shipping firm GAC that they had “significantly” stepped up their support of the project and the Team had negotiated a deal with popular peer-to-peer lending platform worth over £1 million, which ensures the completion of 80ft boat in late spring. Team Britannia are using a boat designed by Hampshire based Professor Bob Cripps, former Technical Director of VT Halmatic. It will slice the waves, rather than surfing them, with its super-efficient design, a variant of the “fast displacement hull.” This reduces fuel consumption by up to 30 per cent, and should make the 23,000 nautical mile trip smoother. In addition to the fuel-efficient design, the vessel will be powered by a revolutionary fuel emulsion developed by Portsmouth based Clean Fuel Ltd – a mixture of diesel, water and emulsifier that when burnt reduces harmful emissions such as particulate matter and NOx. Construction of the 80ft RIB started in 2015 on Hayling Island, near Portsmouth, at the Aluminium Boatbuilding Company. The hull was completed and turned in December 2016 allowing the completion of over 2,000 closing brackets. The installation of the final bulkhead and six massive fuel tanks is under way, but needs to be completed. Once fitted, the next job will be to install the engines and jets, before the wheelhouse is craned into place. Then the fixing and inserts from Technifast will be installed at 750mm intervals over length of the boat, along the top of the hull with the holding plate bolted on. The tubes can then be attached to complete the distinctive look. In total there are more than 2,300 pieces of metal will be welded together by master boatbuilder Paul Johnson and his team, before seven miles of wiring are installed by Alan and his chief engineer Steve Mason.